The corner outside the South African Mission to the United Nations was officially renamed Nelson & Winnie Mandela Corner in 1984. 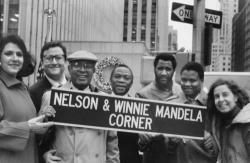 From left to right: New York City Council Members Robert Dryfoos and Wendell Foster (sponsors of the name change); African National Congress (ANC) United Nations Representative J. M. Makatini (South Africa); SWAPO Deputy Representative H. P. Asheeke (Namibia); ANC Deputy Representative David Ndaba and American Committee on Africa Executive Director Jennifer Davis. By permission of Joshua Nessen.